For your next Dumpster Rental Service, look no further than Homestead Disposal Fast. Professional. Dependable. 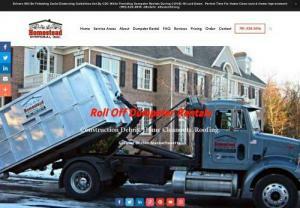 Local Dumpster Rental Company Serving Home Owners and Contractors in Eastern Massachusetts since 2000 Homestead Disposal specializes in Delivery and Removal of only Open Top 7, 10 & 15 Cubic Yard dumpster rentals. As a result, we can use smaller trucks that produce less stress on your driveway, and we can deliver dumpsters to tight areas.